Hanukkah is now well under way, and Christmas is only one week away... Winter holidays are coming and many people in a lot of countries have already started to shop for Christmas gifts and to think about how they can greet the New Year of 2008. I think that celebrations of Hanukkah, Christmas and New Year can unite all people in World, from different countries - all of us want to be with our friends, families, relatives. We want happiness and peace. We want stability now and in future. We wish our relatives strong health and pray to God for them.�We are happy�to�watch how our lovely kids grow�and�prepare them for a�great future! Do you agree with me? If yes, lets drink�to that during�our celebrations of Hanukkah, Christmas and�the New 2008 Year!!! - Happy New 2008 Year! - Strong Health and Happiness to you and your family! - Spend a great time during your Winter Vacation! With this news I would like to post for you a picture which I think will fit 100% to upcoming celebrations of Christmas and New Year. I took this picture on the famous pedestrian street of Moscow, Old Arbat, walking up and down the street with my clients Millie Ball and Keith Marshall on October 28th 2007 and when I got this picture, I immediately decided that I have to post it with the current news. On the picture you can see a Russian vendor who is dressed in traditional, old Russian costume and who has pretty long Russian beard - very typical for past times. The name of this vendor is Vladimir Vladimirovich (is it sounds familiar? Yes! - the same name has our popular president of Russia, Putin! and, by the way, this vendor is proud of it! ), and he sells souvenirs here from 1991. If you will have a chance to be on Old Arbat street, you can find his small booth on the right side at the beginning of the street, if you walk from the Moscow Kremlin. He is very friendly, likes to talk about his daughters (one is ballerina, another - manager in big trade tea company). 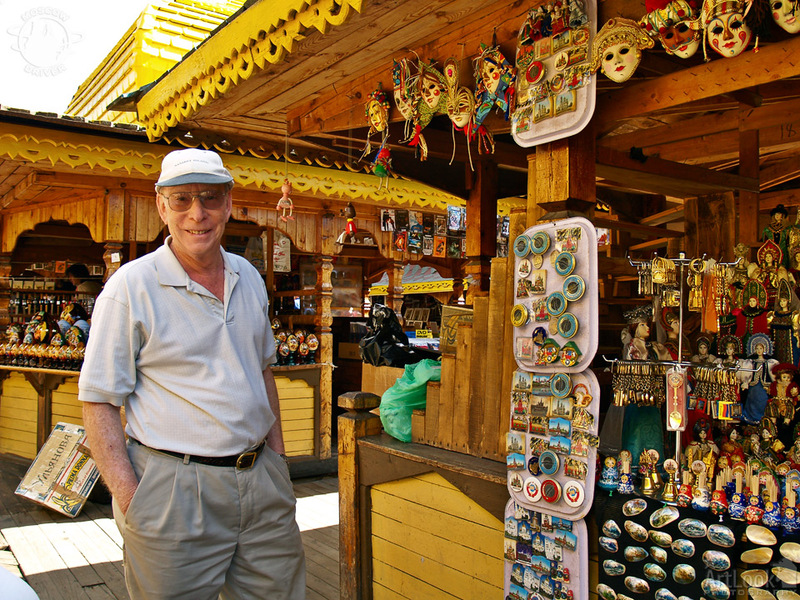 If you will buy some souvenirs in his booth he will be pleased to let you to take pictures with him. Don't miss him when you will be on Old Arbat street, real fun!! !